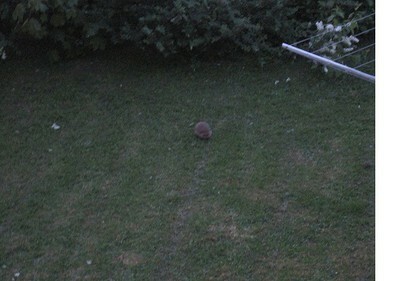 So Phong and I were out for a walk the other evening and when we came home there was a hedgehog in the yard! A hedgehog! In case you're wondering what all the hullabaloo is about, I've only ever seen real hedgehogs in Sweden. (Not counting my friend's tiny angry pet hedgehog.) Every summer I try to keep an eye out for them but it seems every time we see one, I don't have a camera on me! Even this time, I was without a camera. When the hedgehog left the yard to venture into the parking lot and check out my brother-in-law's beamer, Phong and I continued on our way into the building. When we got upstairs I ran to the kitchen window and low and behold, he had wondering into the other side of our yard! I tried taking a picture from the window, but it was too far away to get a good picture. I considered going down and getting closer but I decided a while back (in previous hedgehog thoughts) that I shouldn't get too close or do anything that might influence their directional choices. It's already so precarious outside what with all the pavement, cars, cats, and drunk teens... I couldn't bare the idea of negatively effecting a hedgehogs lifepath. Hedgehogs are adorable. I totally want one. But, like, a retarded one so it's super sweet.